Genoa, a port city on Italy’s northwest coast, has many great points of interest but is often overlooked by tourists heading to beach resort towns along the Italian Riviera. Genoa’s port area has been renovated and has one of Europe’s top aquariums. Its medieval center, full of winding streets to wander, is a pleasure to explore. Several of the city’s elegant Rolli palaces are open to the public and some have been made into museums. There’s plenty of good food, too, and if you run out of things to do, Genoa makes a good base for visiting nearby seaside towns. Buy a Genoa Museum Card good for 25 museums and public transportation in the city for 1 or 2 days. Genoa is on Italy’s main west coastal rail line, between La Spezia and the French border. The city’s two train stations are Piazza Principe, near the historic center, and Brignole. Find out more about Genoa’s train stations and book train tickets on Rail Europe’s guide. The bus depot is in Piazza della Vittoria, near Brignole train station. There’s good local bus service and a metro line but the best way to explore the medieval center is by foot. Public elevators or funicular railways take you up to the parts of the city on the hill. Ferries leave from the port for towns along the coast as well as Sicily, Sardinia, Corsica, and Elba. Genoa has a small airport, Cristoforo Colombo, with flights to Italian and European cities. Hotel Palazzo Grillo is in a historic building on a small piazza near the cathedral, in the pedestrian zone at the heart of the historic center. It has a rooftop terrace with city views. Hotel Bristol Palace, near Piazza de Ferrari and a short walk from the medieval center, has an old-world charm and elegance. Best Western Porto Antico is in a historic building on the harbor by the aquarium, near the ancient gate into the medieval center. There’s a public parking lot a short distance away. Albergo Posta is an economical choice near Palazzo Reale, a short walk from the Piazza Principe train station. 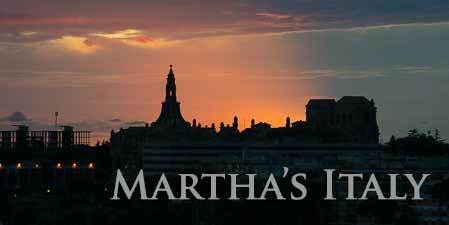 See the city’s top sights with a hop on hop off bus tour, good for 48 hours. 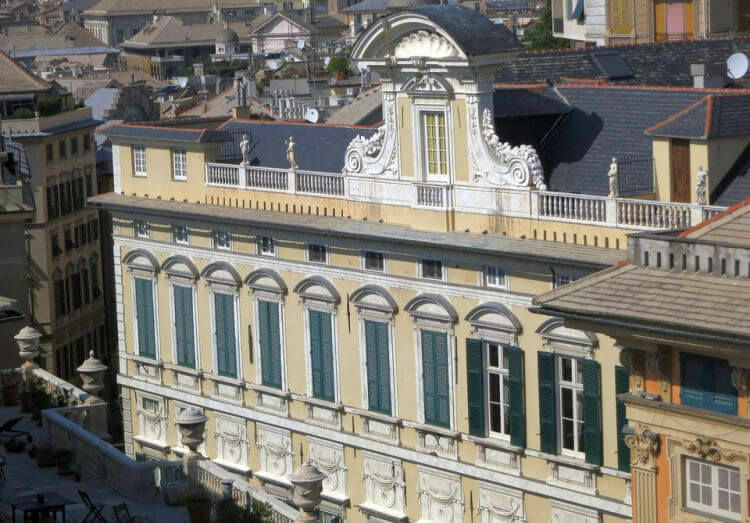 Visit the Rolli Palaces on Via Garibaldi (formerly called Strada Nuova), lavish Renaissance and Baroque mansions built in the 16th – 18th centuries to host visiting dignitaries. 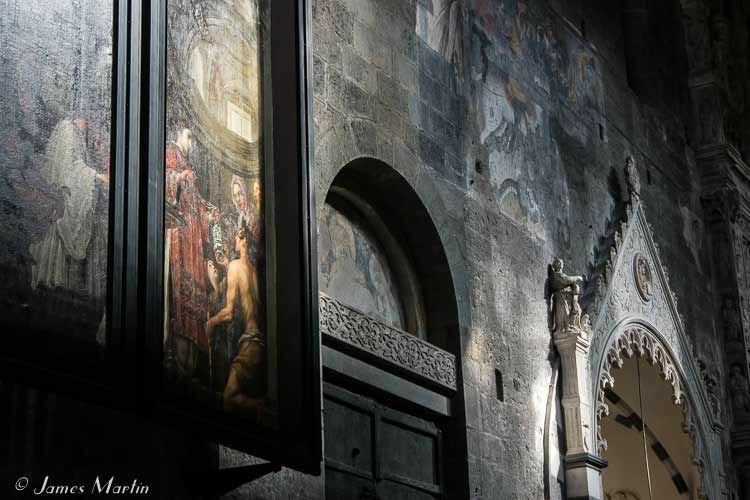 Palazzo Rosso (go up to the roof for great views), Palazzo Bianco (with an art exhibit), and Palazzo Doria Tursi (with objects owned by the city on display, including a Paganini violin) make up the Strada Nuova Museums and can be visited with one ticket. During Rolli Days, usually at the end of May, they’re free and some that aren’t normally open can be visited as well. The Rolli Palaces are a UNESCO World Heritage Site. Visit Palazzo Reale, on Via Balbi, another Rolli Palace. Built in the early 17th century for the Balbi family, it became Palazzo Reale in 1824 when the Royal House of Savoy moved in and remodeled it. It’s now a state museum with historic furniture and art, frescoes, terraces, and gardens. The National Gallery is in Palazzo Spinola, another Rolli Palace, on Piazza Pellicceria. 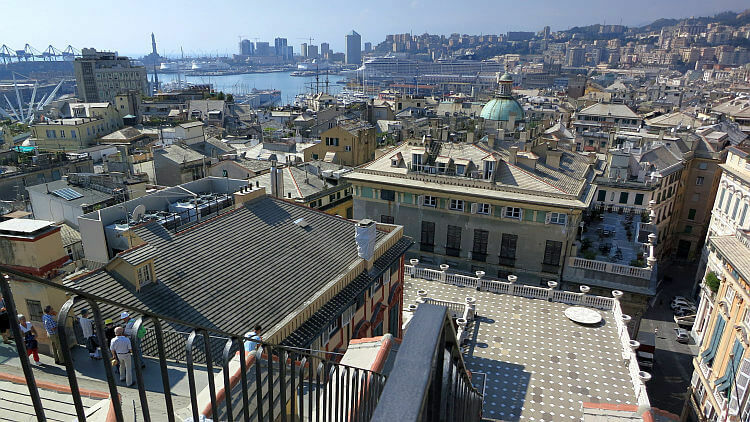 View of Genoa from Roof of Palazzo Rosso. 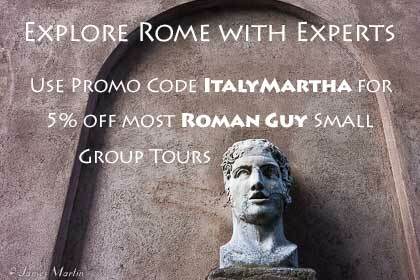 Wander along the carruggi, narrow cobblestone streets, of the medieval quarter, one of Europe’s largest. Within the historical center you’ll come across many small squares, churches, shops, and places to eat. 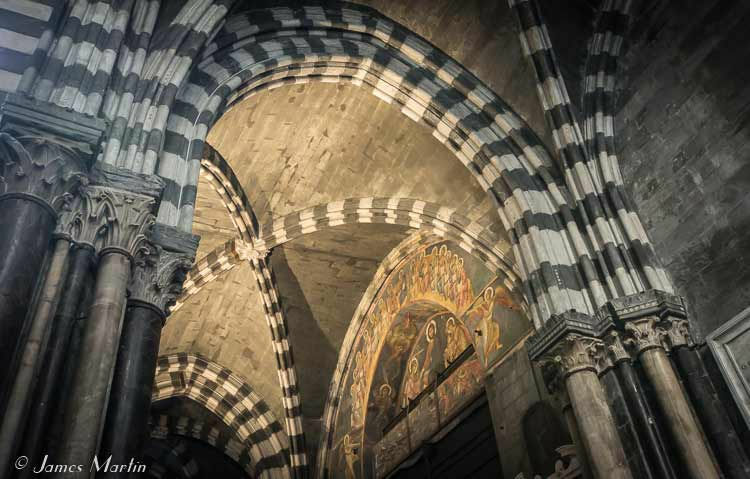 Visit the Romanesque San Lorenzo Cathedral with its black and white striped marble facade and frescoes inside. 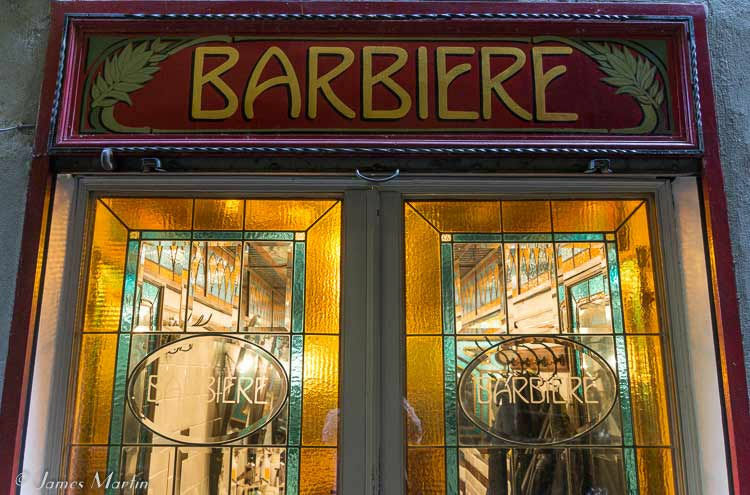 For a great insiders tour of the center, take Beautiful Liguria’s Genoa Old Shops and Tastings Tour. Heading out of the center toward the harbor, you’ll see the 12th century Porta Soprana, a medieval gate in the city walls. Genoa’s port is one of the 2 largest Mediterranean ports. Stroll along the harbor walking path. Visit the Aquarium of Genoa, the largest in Italy, with about 12,000 specimens from seas all over the world. Buy Skip-the-line Genoa Aquarium tickets. Stop in at the Maritime Museum, Galata Museo del Mare, for a look at Genoa’s seafaring history. Also by the port, go up in the Bigo, a panoramic capsule that gives you a scenic look at the port and city from above (Find out more about the Bigo or buy tickets). Near the Bigo, there’s an Eataly store. Harbor cruises are also available. Take the elevator (from Piazza del Portello) up the hill to Piazza Castello, one of Genoa’s hills. In addition to great views, the Castello Hill has several churches and convents including the beautiful Romanesque Church of Santa Maria and the 15th century cloister overlooking the sea. Piazza De Ferrari, with a big fountain in the center and stately buildings around it, is the highlight of the more modern part of Genoa. Near the square are Teatro Carlo Felice, the historic opera house originally built in 1892, and the 13th century Doge’s Palace that houses government offices, the historic archives, and special exhibits. Its medieval tower, Torre Grimaldina, and prison that can be visited on guided tours on Saturday afternoons. What to Eat: Pesto (basil, pine nuts, garlic, and parmigiano cheese made using a mortar and pestle) originated in Genoa and you’ll usually find it served over trenette or trofie pasta cooked with potatoes and green beans. Of course there’s plenty of good seafood, try the local fish stew called buridda. Cima alla Genovese is veal breast stuffed with organ meats, herbs, vegetables, and pine nuts, served cold. Farinate, flat bread made of chickpea flour, and vegetable pies are also typical dishes. A good place to try them is Antica Trattoria Sa Pesto, Via Giustiniani 16r, in the medieval quarter. See Genoa Chiaroscuro for more visiting information and photos. Genoa is in the Liguria region and it’s a good base for visiting nearby Italian Riviera towns, either by train or by ferry in good weather. Santa Margherita Ligure has beaches, shops, a seaside promenade and historic center but it’s mainly visited as the gateway to Portofino, reached by bus or a hike from Santa Margherita. The popular Cinque Terre villages can be visited as a day trip. Going along the coast toward France, visit Noli, one of the borghi piu belli d’Italia and Villa della Pergola Gardens in Alassio, only open on weekends.